Retrofitting an existing coal-fired power plant refers to installing pollution reduction technology such as a scrubber, or technically known as a flue gas desulphurization system to an already existing coal burner. These scrubbers are installed to reduce sulfur dioxide (SO2) emissions from the coal-burning process. Coal-fired power plants are the largest human-caused source of sulfur dioxide, a pollutant gas that contributes to the production of acid rain and causes significant health problems. Coal naturally contains sulfur, and when coal is burned, the sulfur combines with oxygen to form sulfur oxides. Although natural processes like volcanic eruptions, biological decomposition, and forest fires also produce sulfur dioxide, emissions caused by human activity far exceed natural production in developed countries. The United States Environmental Protection Agency (EPA) estimates that more than 65%, or over 13 million tons per year, of SO2 production in the U.S. comes from electric utilities, 93 percent of which is produced by coal power plants. In China, the world’s largest consumer of coal, approximately 22.5 million tons of sulfur were released in 2004, and over 30% of the country now experiences acid rainfall. Phase out refers to shutting down existing coal-fired power plants. James Hansen, director of NASA's Goddard Space Institute, has recommended that no further coal plants be built that do not capture their carbon dioxide emissions, and has further recommended that all coal emissions be phased out by 2025 in the developed world and by 2030 in the developing world. According to Hansen, the consequence of emissions continuing beyond that time is increasing risk of passing "tipping points" and "points of no return." Moratorium on new non-sequestering plants. The first recommendation, a coal moratorium, has been the subject of widespread citizen organizing, state-level legislation, and proposed national legislation. The second recommendation, a phase-out of existing plants, has received less attention. To date, no scenarios have been published recommending specific steps to implement the recommendation of a coal plant phase-out. Several scenarios outlining a reduction in coal usage, generally targeted at a later date than recommended by Hansen, have been published. In March of 2010 Natural Capitalism Solutions, an environmental advocacy group based in Longmont, Colorado, released a report that favored phasing out existing coal plants over retrofitting them with scrubber technology. The report titled, “Coal Plants in Transition: An Economic Case Study,” provided a “proof of concept” for utilities to consider as they evaluate investments in new generation capacity and upgrades to existing facilities. Using the 35-year old, 2,250-megawatt Navajo Generating Station near Page, Ariz. as a case study, the group's analysis examined the costs and benefits of the plant’s future. As with many aging power plants nationwide, Navajo is due for upgrades necessary for it to comply with the EPA's pollution and air quality regulations. The report notes that retrofits can entail substantial costs, running into the hundreds of millions of dollars. The report states that such facilities, in order to protect jobs and move in a more environmentally safe direction, will be more profitable by abandoning retrofit plans and instead embracing a full range of clean energy resources, including wind, photovoltaic and concentrated solar, geothermal, and biomass, combined with large-scale supply and demand- side efficiency measures. However, it has been argued by some environmentalists and others that retrofitting existing coal-fired power plants with scrubbers does not address carbon dioxide emissions, and in doing so prolongs the life of power-plant that should otherwise be shut down in order to reduce global CO2 emissions. In September 2007 Canada's Progressive Conservative planned to spend $1.3 billion to install scrubbers on Ontario‘s coal plants. Environmentalists countered that installing the scrubbers would take years and would do nothing to fight climate change because greenhouse gases are not captured by scrubber technology. Such approaches were called "band-aid" tactics by critics. 3.7 million tons of carbon dioxide (CO2), an amount equivalent to chopping down 161 million trees. CO2 pollution is the principal human cause of global warming and climate change. 10,000 tons of sulfur dioxide (SO2), which causes acid rain and forms small airborne particles that can cause lung damage, heart disease, and other illnesses. 10,200 tons of nitrogen oxide (NOx), equivalent to half a million late-model cars. NOx leads to formation of smog, which inflames lung tissue and increases susceptibility to respiratory illness. 500 tons of small airborne particles, which can cause bronchitis, reductions in lung function, increased hospital and emergency room admissions, and premature death. 220 tons of hydrocarbons, which contribute to smog formation. 720 tons of carbon monoxide (CO), which causes headaches and places additional stress on people with heart disease. 170 pounds of mercury. 1/70th of a teaspoon of mercury deposited in a 25-acre lake can make the fish unsafe to eat. Mercury also causes learning disabilities, brain damage, and neurological disorders. 225 pounds of arsenic, which leads to cancer in 1 out of 100 people who drink water containing 50 parts per billion. 114 pounds of lead, 4 pounds of cadmium, and other toxic heavy metals. These toxic metals can accumulate in human and animal tissue and cause serious health problems, including mental retardation, developmental disorders, and damage to the nervous system. The main health effect of SO2 is to impair the function of the upper respiratory system. High concentrations of sulfur dioxide can affect breathing, cause respiratory illnesses, and aggravate existing heart and lung diseases. Exposure at very low concentrations can irritate the lungs and throat and cause bronchitis. Exposure to low levels of SO2 over a long period depletes the respiratory system's ability to defend against bacteria and foreign particles. Particularly sensitive groups include children, the elderly, people with asthma, and those with heart or lung disease. Sulfur dioxide contributes to the formation of acid rain, which damages forests, crops, and buildings, and acidifies lakes, streams, and rivers, making them unsuitable for aquatic plant and animal life. Continued exposure to SO2 over an extended period of time can permanently alter the natural variety of plants and animals in an ecosystem. Sulfate particles are also the major cause of smog in many parts of the U.S.
Coal-fired power plants are responsible for one-third of America’s carbon dioxide (CO2) emissions—about the same amount as all transportation sources -- cars, SUVs, trucks, buses, planes, ships, and trains -- combined. A 1000 megawatt (MW) coal-fired power plant produces approximately the same amount of global warming as 1.2 million cars. Coal-to-liquids technology will have particularly intensive climate effects. According to the Environmental Protection Agency, using liquefied coal as a fuel source would produce 119 percent greater greenhouse gas emissions than using petroleum-based fuel. For 1999, the U.S. Energy Information Agency estimated that coal plants produced 2.095 pounds of carbon dioxide per kilowatt hour. This represented a 4% improvement from the 2.117 pounds per kilowatt hour in 1998. In 1981, a group of atmospheric physicists led by James Hansen published an article in Science magazine pointing out that as of 1980 coal usage was responsible for 26 parts per million (ppm) out of the total of 42 ppm that had been added to the atmosphere by human activity. Moreover, the paper pointed out that of the potential airborne carbon dioxide in recoverable reservoirs 1000 ppm was associated with coal compared with only 220 ppm with oil, gas, and unconventional sources. The study charted various scenarios to the year 2100, including "coal phaseout beginning 2020" and "coal phaseout beginning 2000." Both produced about half the global temperature gain of a "fast growth" scenario that included synthetic fuels. NASA scientist James Hansen, who reported to the U.S. Congress that climate change was underway in 1988, has been particularly critical of the coal industry, stating that coal contributes the largest percentage of anthropogenic carbon dioxide into the atmosphere. He acknowledges that a molecule of carbon dioxide emitted from burning coal has the same effect as a molecule emitted from burning oil, but that the difference is where the fuel originally resides. He says that most oil comes from Russia and Saudi Arabia, and that no matter how fuel-efficient automobiles become, the oil will eventually be burned and the carbon dioxide emitted. In a 2007 testimony before the Iowa Utilities Board, he stated that the United States has a large reservoir of coal, which makes it a resource that can be controlled through action by U.S. politicians, unlike oil which is controlled by other countries. The amount of carbon remaining in the ground in oil and gas reserves is much smaller than the amount of carbon contained in coal reserves. "Second, coal is the most carbon intense of the fossil fuels. Producing a kilowatt-hour of electricity from coal produces about 2.4 pounds of carbon dioxide, while producing a kilowatt-hour of electricity from natural gas produces about 1 pound of carbon dioxide. While coal produces half of the electricity used in the United States, it is responsible for 80 percent of the carbon dioxide released by electric utilities." "Third, coal consumption is far more concentrated than the use of other fossil fuels. A mere six hundred large coal-burning power plants account for nearly all coal usage, in contrast to the tens of millions of cars, trucks, planes, homes, businesses, and factories that burn oil and gas. Thus, reducing emissions from coal is a far simpler task." "Fourth, production of oil and gas is primarily located in countries that American domestic energy policy has little or no ability to control. Any reduction in use by the United States might well be consumed by other countries. In contrast, our ability to control the consumption of coal is substantial, since the United States leads the rest of the world in the size of its coal reserves." Several issues have prompted coal-fired power plants to install scrubbers on their smoke stacks. Under the New Source Review requirements of the Clean Air Act when a major upgrade is made to an existing plant they must install the most up to date pollution reduction technologies. A series of lawsuits has mandated that plants across the country install scrubber technologies as part of state air control laws. Additionally, regulations in certain states require coal-fired power plants to upgrade and install scrubbers. Environmental groups, such as the Sierra Club, have been involved in litigation against several power companies over these issues. In addition, some plants have opted to shut down instead of installing scrubber technologies. In November of 1999, the United States Department of Justice on behalf of the EPA charged seven utilities with violation of the New Source Review requirements of the Clean Air Act. The EPA asserted that these utilities had made major modifications to their plants without installing proper equipment required to control for acid rain, smog and soot. The EPA contends that these seven lawsuits were a major step taken by the government to halt pollution that is illegally released from coal-fired power plants. The EPA also stated that for years these plants operated without proper emissions-control technology. The enforcement initiative targeted 17 coal-fired power plants in Alabama, Florida, Georgia, Illinois, Indiana, Kentucky, Mississippi, Ohio, Tennessee, and West Virginia. In addition the EPA issued Notices of Violations to these companies, as well as an administrative order against the Tennessee Valley Authority. The EPA notes that the "enforcement effort under the Clean Air Act to date, the complaints, Notices of Violation and administrative order cover 32 plants located in 10 states", effecting a total of 17 different utility companies. As a result of the EPA Coal Plant Settlements, the plants involved were mandated to install scrubbers as well as pay penalties. New Source Review requirements, however, do not include emission controls for CO2. While the EPA enforces federal regulations of coal-fired power plant emissions, States also often enforce their own clean air statutes and permit processing. Currently California has some of the most stringent regulations governing air quality and Wyoming some of the most lenient. State Land Boards and Departments of Environmental Quality also often require environmental assessments and are equipped with the power to expand or halt existing power plant or mining permits. The Surface Mining Control and Reclamation Act (SMCRA) was the first national surface mining law and was enacted the late 1970s. The law led to the development of strict regulations in the industry. In addition, the Office of Surface Mining (OSM) regulates surface coal mining, and the Mine Safety and Health Administration (MSHA) regularly inspects coal mines. On December 9, 2009 We Energies, which owns a 25 percent stake in Edgewater Generating Station, announced it was looking to sell its share in the company. We Energies cited the $38 million it is to contribute to the installation of scrubber technology, which would ultimately cost $150 million, as the main reason for its attempted sale. The remaining 75 percent of the company is owned by Alliant Energy. We Energies does not believe the putting money into scrubbers technology is a wise investment. The Sierra Club's John Muir Chapter was vocal in pushing for equipment to be installed. On April 30, 2009 Stern Brothers & Co. released a report which called on Menasha Utilities to close down its Menasha Power Plant located in Menasha, Wisconsin. The report cited $41 million in debt, poorly crafted contracts and risk in continuing operations as the main reasons to close the plant. Additionally, the report cited worries about potential threat of actions by the state Department of Natural Resources, the EPA and the Sierra Club to force installation of pollution control equipment in the coal-fired plant that will cost money and could create risks of future litigation. The existing Jim Bridger Steam Plant in Wyoming comprises four units, totaling 2110 megawatts (MW) of capacity. Completed in 1974, these generators use coal from the Bridger Coal and Black Butte mines. In 2006, PacifiCorp announced its intention to build a 600-800 MW expansion at the same site. On Jan. 18, 2007, the Oregon Public Utility Commission argued that PacifiCorp had failed to demonstrate a need for new coal-fired facilities in Wyoming and Utah. On June 7, PacifiCorp, based in Oregon, announced plans to build 1200 miles of transmission lines to connect the proposed plant to customers in three other states. The power produced at the Jim Bridger facility is primarily exported to the Northwest to supply power. On Nov. 28, 2007, PacifiCorp notified the Utah Public Service Commission that it was no longer pursuing this project, due to “the time frame and the uncertainty around coal, based on climate change issues.” Ultimately, PacifiCorp is concerned about potential for clean energy projects in the quest to reduce carbon dioxide emissions. In March of 2008 Alliant Energy based in Madison, Wisconsin received a notice of intent to sue from the Sierra Club. The notice claimed that the company did not file applications for air permit renewal on a timely basis and in doing so violated the Clean Air Act. In 2009, as a result of pressure from the Sierra Club and others, the federal government revoked its permit to the Columbia Energy Center. The result could mean that Alliant will be forced to install pollution reduction equipment or it could mean shutting down the facility for good. On September 28, 2009, three environmental groups filed an appeal of the Centralia Power Plant's air quality permit with the Washington State Pollution Control Hearings Board. The groups, which include the National Parks Conservation Association, the Northwest Environmental Defense Center, and the Sierra Club, argue that the permit fails to impose limits on mercury and greenhouse gas emissions and does not require best available control technologies for nitrogen oxides. Public Citizen in 2004 ranked the Centralia plant as the 36th most polluting power plant in the United States for carbon dioxide CO2 emissions. The group notes that even with scrubbers installed that CO2 emissions would not be affected. In July, 2007, the Sierra Club put Energy Future Holdings Corp. and its subsidiary, Luminanat, on notice that the group intended to sue the company for Clean Air Act violations at its Martin Lake Steam Station. The plant was rated as the first in the nation for power plant mercury emissions in 2005, emitting a total of 1,705 pounds of mercury that year. The Sierra Club claimed that both the U.S. EPA and the Texas Commission on Environmental Quality ignored soot pollution and other violations at the facility. They also claimed that Martin Lake was one of the dirtiest plants in the entire country in regard to particles, mercury, sulfur dioxide, nitrogen oxide and carbon dioxide. These toxins, the Sierra Club noted, are producing a great health risk to communities nearby. The facility currently uses scrubber technology. Martin Lake ranked 5th in terms of largest carbon dioxide emissions according to a 2009 report by Environment America, "America's Biggest Polluters," the Martin Lake station is the fifth dirtiest plant in the nation, releasing 21.8 million tons of carbon dioxide in 2007. Ranking is based upon Environmental Protection Agency data. Bull Run Fossil Plant is a coal-fired power station owned and operated by Tennessee Valley Authority (TVA) near Oak Ridge, Tennessee. The Bull Run power station has a single coal-fired generating units and "net dependable generating capacity" of approximately 870 megawatts. TVA states that "the plant consumes some 7,200 tons of coal a day." Construction of the Bull Run power station commenced in 1962 and was commissioned in 1967. According to the TVA the "plant consumes about 7,300 tons of coal a day." According to the U.S. EPA, TVA's Bull Run was responsible for nearly 60 percent of Knoxville area's pollutant emissions in 2002, with 41,190 tons of airborne pollutants released that year. In 2008, the plant was upgraded the plant with scrubbers to reduce sulfur dioxide emissions. However, the National Parks Conservation Association (NPCA), Children's Earth Foundation and the Sierra Club are still suing TVA for alleged violations of the Clean Air Act because the scrubbers were not installed according to New Source Review rules of the Clean Air Act when the plant did upgrades in 1988. As of summer 2009, the litigation was still pending. In June of 2008 the Sierra Club filed a lawsuit against Otter Trail Power, the owner and operator of Big Stone Power Plant (Big Stone I), accusing the company of violating the Clean Air Act as the company failed to install modern pollution controls when the facility was upgraded. In the summer of 2009 the suit was dismissed by a federal judge claiming the statute of limitations had expired. The Sierra Club then appealed the decision to the 8th Circuit Court of Appeals. The Sierra Club had originally asked the judge to force the utility to install scrubbers to reduce pollution before they build, the now-abandoned, Big Stone II. However, the Sierra Club's ultimate goal is to shut down Big Stone I in an attempt to reduce carbon dioxide emissions. The Four Corners Steam Plant, one of the largest coal-fired generating stations in the United States, is located on Navajo land in Fruitland, New Mexico. The plant’s five units generate 2,040 megawatts of electricity and are operated by Arizona Public Service Company, which serves about 300,000 homes in New Mexico, Arizona, California, and Texas. The American Lung Association estimates that 16,000 people in the region (15 percent of the population) suffers from lung disease probably caused by plant emissions. Each year the plant emits 157 million pounds of sulfur dioxide, 122 million pounds of nitrogen oxides, 8 million pounds of soot and 2,000 pounds of mercury. The plant's five burners utilize scrubber technology to reduce sulfur dioxide and were installed in the 1960s. The San Juan generating station is nearby, in Farmington, New Mexico. The 1800 megawatt plant emits approximately 100 million pounds of sulfur dioxide, 100 million pounds of nitrogen oxides, 6 million pounds of soot, and at least 1000 pounds of mercury per year. The proposed Desert Rock coal plant is within a 20 mile radius of the Four Corners and San Juan plants. In addition to air pollution, waste from the coal mines supporting the Four Corners and San Juan plants has contaminated the water with sulfates, leading to the death of livestock. According to one source, 70 million tons of coal combustion waste (containing cadmium, selenium, arsenic, and lead) has been dumped in the Navajo Coal Mine, and combined with the San Juan mine, amounts to a total of 150 million tons. 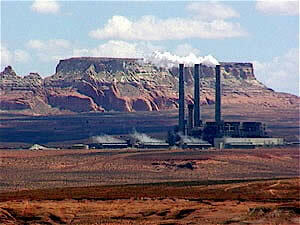 In July 2007 the EPA, as a result of a legal challenge by the Sierra Club and others, issued a plan to regulate pollution from the Four Corners plant. However, the Sierra Club believed that instead of issuing a plan to protect public health, the agency simply created a plan to "fill the gap they left by not regulating Four Corners in the first place." On July 5, 2007 the Sierra Club took legal action against the EPA to force the agency to "live up to their responsibility to the health and safety of local communities." In August 2008, the future of the Merrimack Station, the state's largest coal plant, became the subject of controversy when plant owner PSCNH revealed that the projected cost of new mercury-control scrubbers had increased from $250 million to $457 million. The scrubbers would reduce mercury emissions by 80 percent. An ad hoc group of 24 businesses, led by Stonyfield Farms CEO Gary Hirshberg and including inventor Dean Kammen and Timberland President Jeffrey Schwartz, petitioned the state to reconsider the scrubbers. Energy analyst Symbiotic Strategies LLC made an assessment of the future costs to comply with increased greenhouse gas, mercury and other requirements. It came up with an additional cost of between $864 million and $2.5 billion. The impact on ratepayers would be three to six times higher than PSNH's estimated increase of one-third of a cent per kWh for the scrubber project, according to the analysis. On March 13, 2009, the New Hampshire Senate Energy, Environment and Economic Development Committee held a hearing on a bill that would order a review of the scrubbers. About 150 trade union members attended the hearing wearing T-Shirts that said “Don’t scrub my job.” Environmentalists supported the study, as did Hirschberg's businesses coalition. Several speakers saying Merrimack Station should be closed. Representatitives of the Concord and Nashua chambers of commerce testified against the bill, as did labor groups and officials from Bow, Hooksett and Manchester. On April 8, 2009, proposed bill SB-152 was defeated in the New Hampshire State Senate by a vote of 21-1. Lee is scheduled for retirement in 2013. Sutton is slated for closure in 2014. Progress hopes to replace it with a natural gas-fired power plant. Cape Fear and Weatherspoon will be shut down between 2013 and 2017. The company is considering converting 50 to 150MW of the total capacity to burn wood waste. The closure plan was filed in response to a request by the N.C. Utilities Commission, which ordered Progress to provide its retirement schedule for "unscrubbed" coal-fired units in North Carolina. The request was a condition of the commission's approval of Progress' plan to close Lee and build a 950-MW natural gas plant at the site. In August 2009, Puget Sound Energy (PSE), Washington State's largest energy provider released its energy plan that was criticized by the Sierra Club and others for continuing its business-as-usual approach by promoting the use of coal-generated power. Approximately two-thirds of PSE's coal power comes from the Colstrip Steam Plant in eastern Montana. PSE’s use of energy from Colstrip resulted in 6.3 million tons of greenhouse gas emissions in 2008. In 1977 Colstrip was equipped with scrubbers which reduces its sulfur dioxide output. However, critics of the plant note that the burners still turn out massive amounts of carbon dioxide. According to a 2009 report by Environment America, "America's Biggest Polluters," the Colstrip Steam Plant is the ninth dirtiest plant in the nation, releasing 19.3 million tons of carbon dioxide in 2007. Ranking is based upon Environmental Protection Agency data. Additionally, the facility's coal-ash pond has caused extensive damage and the owners were forced to pay $25 million in the Spring of 2008 to 57 local residents. Entire aquifers in the area have been polluted. Entergy is currently debating whether or not to install scrubbers to reduce sulfur dioxide emissions at its White Bluff Generating Plant in Arkansas. On November 17, 2009 a public hearing took place where local citizens were allowed to weigh in on the issue. The total cost of scrubber installation is approximated at $750 million, causing a backlash from those who want to see the facility shut down. In early December 2009 it was announced that a hearing scheduled for March 8, 2010 was postponed due to concerns raised by the EPA and United States Forest Service and United States Fish and Wildlife about environmental concerns. Construction is still expected to begin in late 2010 and be completed in 2013. Critics of the proposed installation believe the plant should pursue alternative, clean energy sources and not install scrubbers as they do not decrease the facilities contribution to carbon dioxide emissions. The Boardman Plant in Oregon has increasingly come under scrutiny from Oregonians and local environmental groups. The Sierra Club, Friends of Columbia Gorge and others sued Portland General Electric (PGE) in September of 2009, arguing that the power company had violated clean air regulations and in October a federal judge dismissed PGE's motion to dismiss the lawsuit. The basis of the argument was that PGE had updated the facility but had not met Clean Air Act requirements to reduce sulfur dioxide pollution. However, the groups involved in the lawsuit do not want PGE to install scrubbers and want the facility shut down instead. On September 25, 2009 PGE held a public meeting in Portland to discuss a proposed high-capacity transmission line. However, the bulk of the public input centered around the future status of the Boardman coal plant. Critics questioned whether or not a proposed $560 million investment in the plant for pollution control measures was too risky given the possibility of a future plant closure. Prior to the meeting, on September 23, 2009, a coalition of environmental and ratepayer advocates sent a letter to PGE urging the company to evaluate shutting the plant down by 2020 rather than investing in pollution control upgrades. On January 14, 2010 it was announced that Portland General Electric will be closing its Boardman Plant twenty years ahead of schedule. The plant will close in 2020 instead of 2040. The plant was originally going to invest more than a half billion dollars in pollution controls (scrubbers) by 2017 to comply with EPA and state clean air regulations, then keep it running until 2040. Instead, the company wants regulators to allow it to make a $45 million investment by 2011 to partially clean up its emissions of mercury and oxides of nitrogen, then operate the plant until 2020. In July 2009, five groups of environmental and public health advocates announced their intent to file a Clean Air Act lawsuit against Edison International subsidiary Midwest Generation. The groups say Midwest's six Illinois power plants are decades old and do not have the appropriate pollution controls according to EPA standards. Specifically, the lawsuit focuses on opacity violations, a measurement of the light blocked by particulate matter from smokestacks at Midwest's Crawford, Fisk, Joliet, Powerton, Waukegan, and Will County stations. The concerned groups include Citizens Against Ruining the Environment, the Environmental Law and Policy Center, Natural Resources Defense Council, the Respiratory Health Association of Metropolitan Chicago, and Sierra Club. The six power plants in question are located in working class and minority neighborhoods, raising concerns about environmental justice. The groups expect to file a suit that insists Midwest Generation come into compliance or stop operating, or unless the EPA takes other measures. Shannon Fisk, an attorney for NRDC, described Midwest's Fisk and Crawford plants as, "two dinosaurs in the middle of a large city. They should have cleaned up decades ago. Running those plants is inexpensive for the company, but it's very expensive for public health." A 2001 study by a professor at the Harvard University School of Public Health found that particulate matter from the Fisk and Crawford plants contributes to 41 deaths, 550 emergency room visits, and 2800 asthma attacks each year. Midwest spokesman Doug MacFarlan said the company is being targeted unfairly, and that Midwest's plants release less particulate matter than most. He also said the company had responded to local complaints by reducing both the amount of coal piled up at Crawford and the dust that blows off barges transporting its coal. "We really believe we have demonstrated environmental responsibility at those plants," McFarlan said. In 2006, Midwest made an agreement with the state of Illinois to reduce emissions at its coal plants. The company has installed mercury controls, but has not decided whether to install scrubbers or shut the plants down. The company has until 2015 to install scrubbers at its Fisk plant and until 2018 at its Crawford plant. Valley Watch's Executive Director, John Blair, has called the Clifty Creek Station near Madison, Indiana "one of Indiana's largest, dirtiest and oldest coal fired power plants Coming on-line in 1955 to serve a single customer--the now defunct uranium enrichment facility operated by the U.S Department of Energy in Portsmouth, Ohio- Clifty Creek today is nothing more than an incredibly old and dirty 'merchant' plant." In 2003 Valley called for a comprehensive study on the environmental and health effects of the plant in the area. In 2007 the Environmental Integrity Project (EIP) asked the EPA to add 16 additional sites to its Coal Combustion Waste Damage Assessment list. Included in EIP's report was Clifty Creek, which they stated that the waste from the site is polluting groundwater tables. While no lawsuits have yet to be filed Clifty Creek is the 52nd most polluting coal waste site in the nation. Even so, scrubbers are set to be installed at the facility by the end of 2010. Valley Watch and others have argued that this will only prolong the life of the plant and not address carbon dioxide emissions or coal waste problems. Currently the Navajo Station is debating whether or not to install scrubbers to help reduce sulfur dioxide (SO2), a pollutant discharged from the burning of coal which is regulated by the U.S. EPA and can contribute to acid rain. Costs could reach $600,000 million to $1 billion to install these scrubbers at the Navajo Station. The EPA has proposed the scrubbing system which uses ammonia to reduce SO2. The Salt River Project, Navajo's managing partner, says this could add about $13 million a year to the plant's operating budget and those expanses would be passed on to customers. The ammonia must be injected into the system after the coal is burned. To reach the plant, the chemical would be delivered to Flagstaff by railroad and then trucked to Page, where the only service is a direct rail line from the Kayenta coal mine that produces coal for the plant. "It would be a very significant capital investment and challenging to do the work," said Glenn Reeves, SRP's manager of power generation. "We would have issues just getting approval from all the owners. There are a lot of uncertainties around coal plants right now." The Los Angeles Department of Water and Power holds a 21 percent interest in Navajo and under California law, faces strict rules about putting money in coal-fired plants and is currently deciding whether or not to walk away from Navajo if the expenses and risk of a future closure are too high. The final decision will likely be made by the middle of 2010. The proposal is still open to public comment. Grand Canyon Trust and the Sierra Club are pressuring owners of Navajo Generating Station through talks to clean their emissions, or close regardless of a cleanup effort. In 2009 Xcel Energy and the City of Boulder, Colorado were in negotiations to renew Valmont Station's contract with the city. The agreement must be renewed every five years and was slated to expire in August 2010. Many Boulder residents pushed for the plant to stop burning coal and either shut down entirely or convert to cleaner energy. On July 14, 2009, the Colorado Air Quality Control Commission held a hearing to solicit public comment on renewing the plant's permit. More than 300 people turned out to oppose the plant at a rally before the meeting. About 50 people addressed the Commission, asking its members to deny the permit because the plant emits more than 1 million metric tons of carbon dioxide each year. However, the Air Quality Control Commission disregarded the public comments in opposition to renewing the permit and gave the plant the go-ahead to continue its operations. The Commission ignored an Executive Order by Governor Bill Ritter to limit greenhouse gas emissions in the state. Protesters dressed as clowns visited Colorado Governor Ritter's office on November 18, 2009 to urge him to "stop clowning around when it comes to confronting global warming." Environmental groups are opposed to Xcel Energy's request to renew expired permits at its Cherokee Station and Valmont and want the state to pursue clean energy options instead. New research has shown that nitrogen oxide emissions are clouding lakes, changing lake biology, and threatening the aquatic life in the Colorado mountains. On November 19, 2009, residents packed a regulator's hearing on Cherokee where a hearing by state air-quality regulators was taking place and urged officials to deny Xcel's request to renew its permit for Cherokee Station. More than 50 people spoke in opposition to the plant and advocated for a switch to cleaner energy sources. Residents argued that at minimum, regulators should work with Xcel to ramp up natural-gas systems at the plant, and then switch to solar and wind as those technologies mature. Many others said the plant should be closed outright. Fifteen activists demonstrated outside the Colorado Department of Public Health and Environment (DPHE) on November 30, 2009 to demand the denial of Xcel Energy's request to renew its air permit for Cherokee Station. The protesters greeted DPHE employees as they arrived for work and called on the department to close the coal plant. Protestors staged a "die-in" to call attention to the harmful health and environmental effects of coal. Other activists wore hazmat suits and roped off the area with "Global Warming Crime Scene" tape. The permit was eventually granted. ↑ Sulfur dioxide, Tennessee Valley Authority, accessed April 2008. ↑ Sulfur dioxide - What is it? Where does it come from?, EPA, accessed April 2008. ↑ Electricity from coal, Power Scorecard, accessed April 2008. ↑ “Pollution From Chinese Coal Casts a Global Shadow”, New York Times, June 11, 2006. ↑ "Transition from Coal to Clean Energy Makes Good Business Sense" Natural Capitalism Solutions Press Release, March 4, 2010. ↑ "Coal Plants in Transition: An Economic Case Study" Natural Capitalism Solutions, March 2010. ↑ "Environmentalists slam Conservative plan to put scrubbers on coal plants", Canadian Press, September 13, 2007. ↑ Particulate Pollution, NRDC, accessed April 2008. ↑ Air Pollution in the Mountains, Appalachian Voices, accessed April 2008. ↑ Public Benefits of Renewable Energy Use, Union of Concerned Scientists, 1999. ↑ 15.0 15.1 Sulfur dioxide: Health and environmental impacts of SO2,EPA, accessed April 2008. ↑ http://www.pca.state.mn.us/air/emissions/so2.html Sulfur Dioxide (SO2) in Minnesota], Minnesota Pollution Control Agency, December 1997. ↑ Historical Fossil Fuel Emissions and Remaining Reserves. Source: Adapted from James Hansen et al., “Target Atmospheric CO2: Where Should Humanity Aim?” Open Atmospheric Science Journal (2008): page 11. Estimates for remaining oil, gas, and coal reserves are from Intergovernmental Panel on Climate Change, Climate Change 2001: Mitigation, B. Metz et al., eds. (New York: Cambridge University Press, 2001). ↑ "Progress Energy Carolinas Plans to Retire Remaining Unscrubbed Coal Plants in N.C.," PRNewswire, December 1, 2009. ↑ Tina Casey, "Progress Energy Joins Stampede Away from Coal," Reuters, December 2, 2009. ↑ Expansion Planned at Bridger Power Plant, Casper Star-Tribune, December 4, 2006. ↑ PacifiCorp Announces Plant to Build 1,200 Miles of New Transmission Lines, Columbia Basin Energy Report, May 31, 2007. ↑ PacifiCorp Cancels Wyoming Coal Projects, Wyoming Tribune-Eagle, December 11, 2007. ↑ Sean Ryan, " The Daily Reporter, November 5, 2009. ↑ Jim DePeso, "Green groups appeal air permit for Centralia coal plant," Seattle Energy Policy Examiner, September 29, 2009. ↑ Jim DePeso, [www.whitehouseforsale.org/documents/dirtiest_plants2.pdf "America's Dirtiest Power Plants: Plugged into the Bush Administration,"] Public Citizen, May, 2004. ↑ Tennessee Valley Authority, "Bull Run Fossil Plant", Tennessee Valley Authority website, accessed June 2008. ↑ Tennessee Valley Authority, "TVA's Clean Air Efforts", Charles Maldonado, MetroPulse.com, June 10, 2009. ↑ "PSNH Statement – Senate vote on SB152", Public Service Company of New Hampshire press release, April 8, 2009. ↑ "Mass. tax collectors told stay out of NH", "New Hampshire Business Review", April 9, 2009. ↑ "Puget Sound Energy's new energy plan disappoints: Sierra Club calls on the utility to speed up coal replacement," Sierra Club, August 8, 2009. ↑ ", Kristen Lombardi, The Center for Public Integrity, February 19, 2009. ↑ Roby Brock, "Entergy CEO: Critics ‘will beg’ for Waxman-Markey," Arkansas News, December 12, 2009. ↑ "Stopping dirty coal in Arkansas," Mother Nature Network, November 17, 2009. ↑ "Judge rejects Portland General Electric argument in coal plan pollution case", OregonLive.com, accessed October 6, 2009. ↑ "Joshua Frank, "Will Oregon Close the State's Only Coal-Fired Power Plant?," AlterNet, October 28, 2009." ↑ "Pressure grows for PGE to shutter Boardman coal plant", OregonLive.com, accessed September 30, 2009. ↑ "Portland city leaders oppose PGE's future power plan", OregonLive.com, accessed October 6, 2009. ↑ "PGE moves to close Boardman by 2020", OregonBusiness.com, accessed January 15, 2010. ↑ 72.0 72.1 Kari Lydersen, "'The Clunkers of the Power-Plant World': Old Coal-Fired Facilities Could Escape New Rules," Washington Post, August 17, 2009. ↑ "Comprehensive review sought on Clifty Creek power plant," The Bloomington Alternative, January 12, 2003. ↑ "Comments on the U.S. Environmental Protection Agency's Coal Combustion Waste Damage Case Asessment," Environmental Integrity Project, February 11, 2008. ↑ "Xcel franchise negotiations likely to drag into next year," Colorado Daily, June 3, 2009. ↑ Judith Mohling, "Peace Train: Convert Valmont plant to clean energy," Colorado Daily, July 11, 2009. ↑ Anne Butterfield, "Selfishly seeking clean energy," Daily Camera, July 12, 2009. ↑ "Public packs Valmont power plant hearing," Colorado Daily, July 14, 2009. ↑ Bruce Finley, "Colorado Air Division Thumbs Nose at Governor Ritter," Jeremy Nichols, HuffingtonPost.com October 27, 2009. ↑ Bruce Finley, "Protesters want Colorado to 'stop clowning around' on clean air," Denver Post, November 19, 2009. ↑ Bruce Finley, "Air panel urged to deny pollution permit for Xcel coal plant," Denver Post, November 20, 2009. ↑ "Denver N30:Local Citizens ‘Die-in’ at Dept. of Public Health and Environment in Protest over Coal," It's Getting Hot in Here, November 30, 2009. This page was last edited on 12 June 2011, at 14:42.